This week we go behind the scenes to see how the show comes together. Here we speak to Wendy and Ann our fabulous costume managers to find out just how they go about making us all look good. Costuming a Panto is a mammoth task – tell us how you approach it? Wendy: Well, the first thing is to wonder why we said ‘yes, we’ll do it again’! Once we realise there isn’t any going back, we start to plan. After a meeting with the director, who generally has a good idea of how he/she envisages style, period etc., we start by panicking about the photo shoot which usually takes place before we have really had time to plan very much. It’s all about colour really when it comes to panto and generally the more extreme the look the better, especially where the dame is concerned. Ann : It’s all about teamwork. Wendy is the artistic one I am the technician. I can’t remember now which panto we started doing as a team together but we do seem to have it down to a good partnership now both in the preparation and in the dressing room. I much prefer doing shows that require period or fantasy costumes to modern dress and there is always such a buzz in the panto dressing room. The youngsters love the opportunity to be on stage and I think their excitement rubs off on us. Do you make many of the costumes? Wendy: Ann is the one who has the skills to make costumes and she has made many over the years. We do tend mostly to alter what we already have nowadays, particularly as we don’t have room in the studio for many more costumes!! We often have just the right costume for a character, but it is rarely in the right size so we often have to ‘take-in’ or let-out a garment. What would we do without Google? It gives us lots of ideas for adapting costumes and we can usually find what we need, either on-line or by hiring from other local drama groups.. We do try to keep costs at a minimum, so beg and borrow (we don’t’ often steal!) where we can. This year we even need a banana costume – you don’t see many of those walking around the high street! 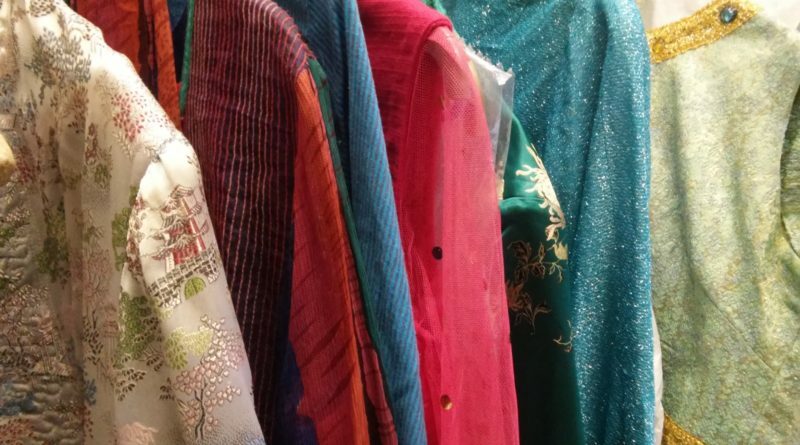 Where do many of the costumes in the studio come from? Ann: Many of the costumes are originals, when it comes to 20th century fashion. We have been lucky enough over the years to be donated costumes from other organisations, including professional ones, so can dress many historical periods. We also keep an eye out for sale items and often rummage about the charity shops too. Wendy’s wardrobe is full of clothes she can’t bear to get rid of, just in case they will come in useful one day – and they often do. What’s it like backstage in Panto? Wendy: Organised chaos comes to mind!. Seriously, we need to ensure that everyone has easy access to their costumes and try to encourage them to take responsibility for their own. Sometimes the children are better at this than the adults! The dame usually needs a personal dresser, as she needs a change of outfit ( including jewellery, wig and accessories for nearly every scene). We usually share the changing room with the props tables and the stage hands are more than likely to come charging through with some enormous piece of complex staging, whilst we are madly trying to do up buttons or tuck in someone’s shirt as they dash back on stage. Trousers split, buttons pop off, a feather comes of hat and all need a very rapid repair. Ann: Mmmm.- on reflection, the worst bit of panto is tackling the mounds of washing and ironing after the final curtain call and especially putting away everything we used, or didn’t actually use, which is often the case. Next week we will be talking to our Stage Manager to find out just how (and why) she manages to keep everything running smoothly behind the scenes.